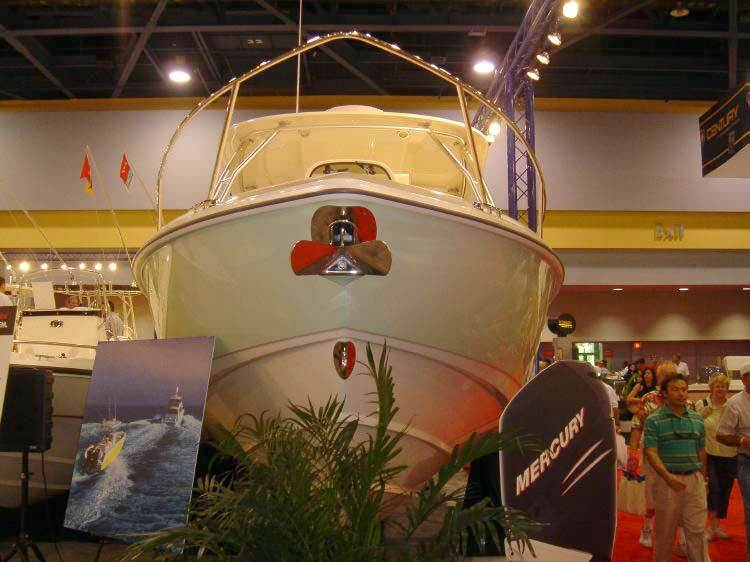 Correspondents Paul Mucciolo and Allan Rossmore sent these great pictures from the Miami International Boat Show. A tip of the hat to them for taking such fine digital images and for being able to e-mail them up to me while at the show. I am sure these will be most everyone's first look at the new boats and motors. Thanks again! 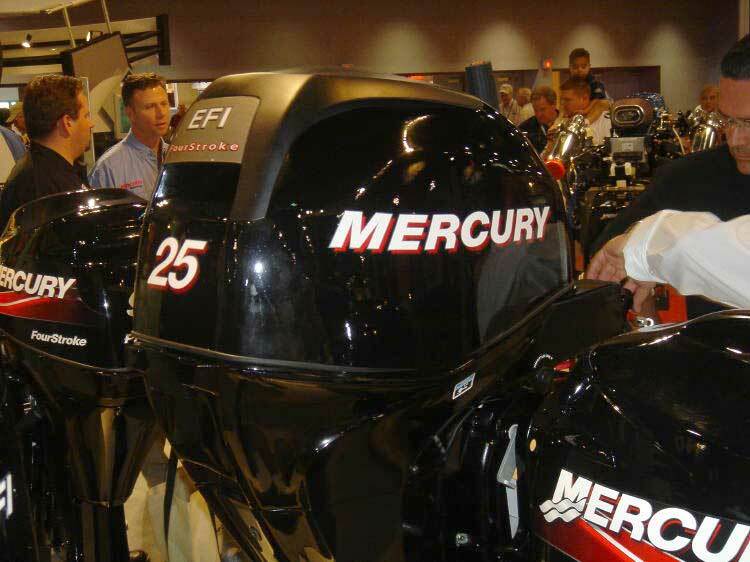 For many attendees, the big buzz was the introduction of new mid-range four-stroke VERADO engines from Mercury. New models in 135, 150, and 175-HP made their debut. Weight was again a concern, as these four-cylinder engines came in at well over 500-lbs. The cowling design was noticeably different from their six-cylinder cousins. Also changed were the engine mounting bracket and steering; both were more conventional. The smaller motors got a new look, too. "I got a ride on an Outrage 240 at the Sea Line marina. It was the only Boston Whaler boat there giving rides, and it was actually set up by Mercury Marine as part of their promotion for their new engines, along with a number of other boat brands. It had two Verado 150-HP engines on it. It was a smooth, enjoyable ride. They ran at 4,000 RPM at just about 30-MPH burning at a rate of 6.5 gallons per side for a total of 13 GPH. At wide open throttle the boat ran right on 45-MPH. At low speed, at 1350 RPM, the GPH was 1.9 but now I can't remember if it was for both or just one engine. I think it was for one. There were 4 adults and 98 gallons of fuel onboard. 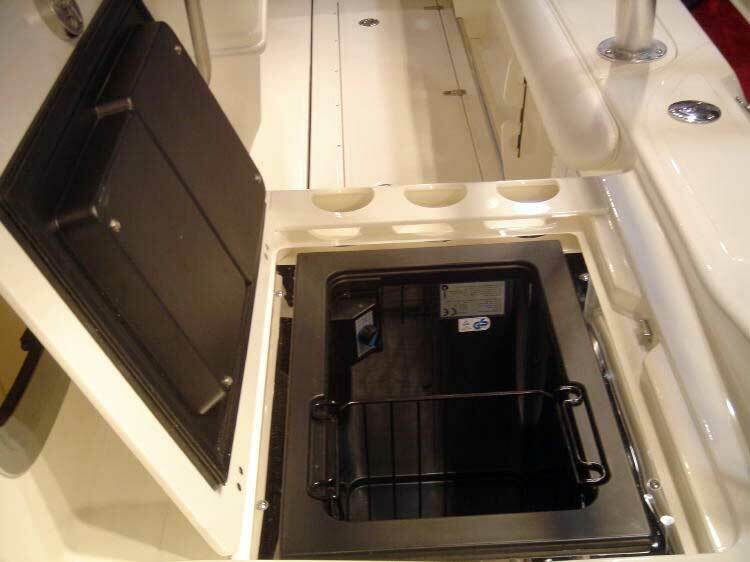 "The Verados were equipped with the Mercury Smartcraft technology, which was very impressive. It had the automatic synchronization, power steering, etc. "I have never been much of a Mercury fan, as you may know, but I believe this ride has changed my perception of that company's products. "The boat also had the Northstar combination GPS, Sounder and Radar all set up through one screen." Mercury Marine and Boston Whaler collaborated to provide this OUTRAGE 240 with twin Verado 150-HP engines for demonstration rides. I am a little skeptical of the two fellas in this picture. One has a NORTH SAILS shirt on--he's probably a rag-bagger--and the other is carrying a YAMAHA bag! I think they got a test ride, nevertheless. It looks like the pilot on this test boat was really giving nice long rides. Here is the wake with Miami in the background from the ocean. Last year our test rides barely made it to the inlet. This one looks like it went for a spin. The Verado 150-HP engines will probably not be available until mid-summer, as they are pegged as 2006 models. Back at the main indoor exposition hall, Paul Mucciolo found the new Verado engines on display, along with some other new Mercury engines. Before looking at all the VERADO motors, let's start with a new 25-HP four-stroke with Electronic Fuel Injection. This is a 3-cylinder engine, 526-cc displacement, with single overhead cam. The dry weight is 163-lbs. The drop line of the cowling looks very familiar. Where have we seen that before? 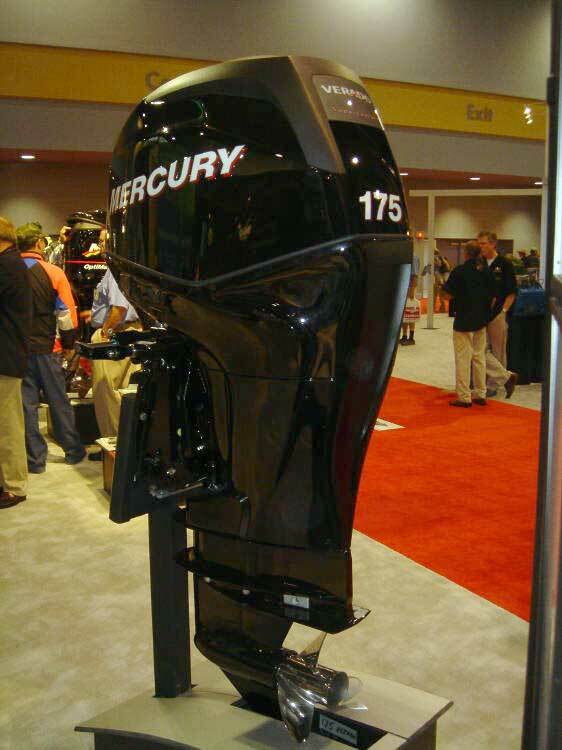 The new I-4 Mercury four-stroke Verado is a tower of power. The new 150-HP Verado was also shown in the MARINER brand trim. This is the overseas marketing brand for Mercury. 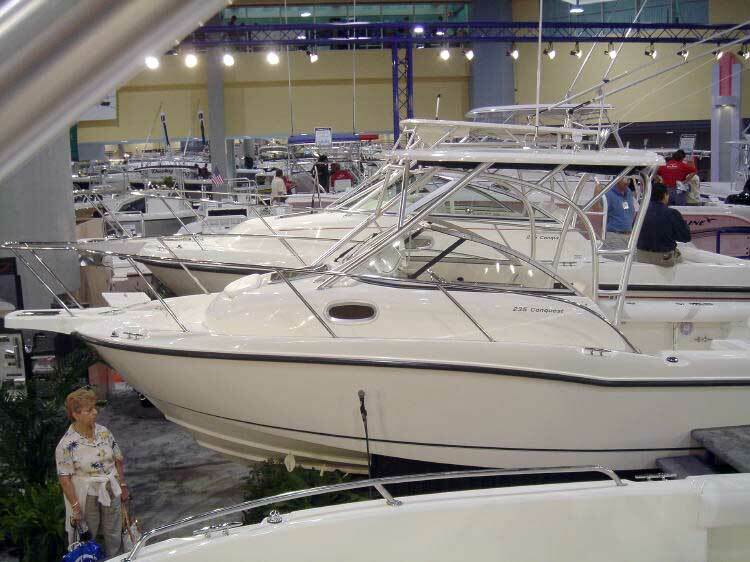 After all, it is the "international" boat show! Note that the engine mounting bracket is more conventional. All of these new Verado engines are equipped with the Mercury Universal Steering Cylinder seen here. This provides manual hydraulic steering. This should simplify rigging and reduce pricing on these mid-range models. An electric boost pump can be integrated as an option to provide power steering, as found on the larger Verado engines. The top-rated four cylinder Verado cranks 175-HP from 1.7-liters of displacement. It looks like the hydraulic steering cylinder is a balanced design which moves back and forth on that fixed rod. This means the steering cables will slew around with the engine. Although the sign covers most of it, the mounting bracket looks like the conventional split design with the hydraulic trim and tilt cylinders open and set between the bracket. These two conventional designs should help to control costs on these models. No mention of price has been heard yet. This rear quarter view shows the new Verado cowling. The styling has what you might call a strong Wisconsin heritage. This beautifully prepared cut-away model shows more details of the engine. Close-up view of the cut-away engine showing more details. 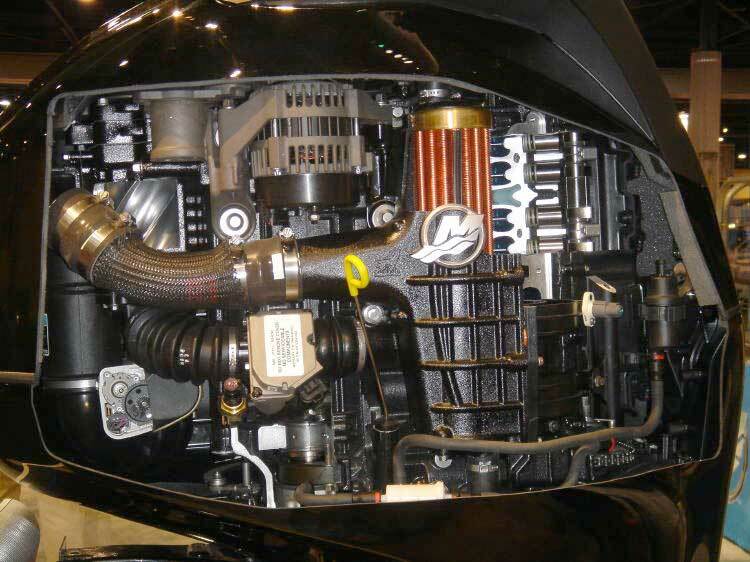 The copper cored inter-cooler downstream of the supercharger is prominent. 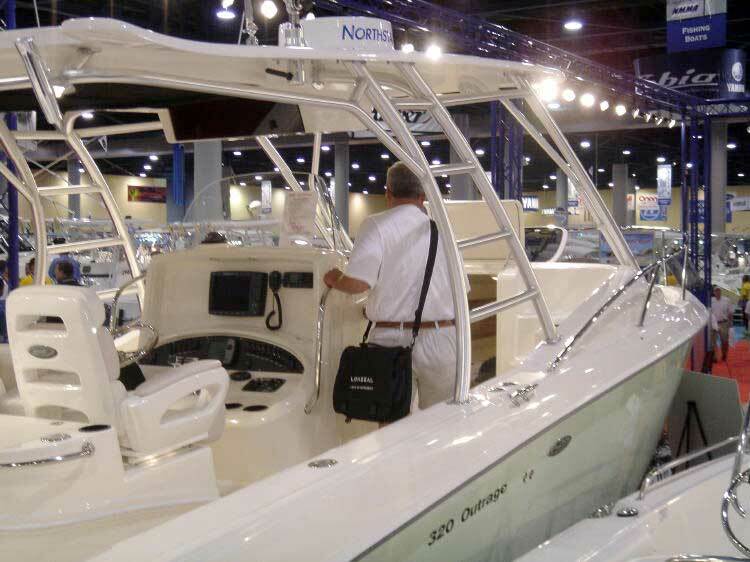 As you might expect with their factory close by, Boston Whaler had a very impressive exhibit at the show, with practically every boat in the catalogue on the show floor. 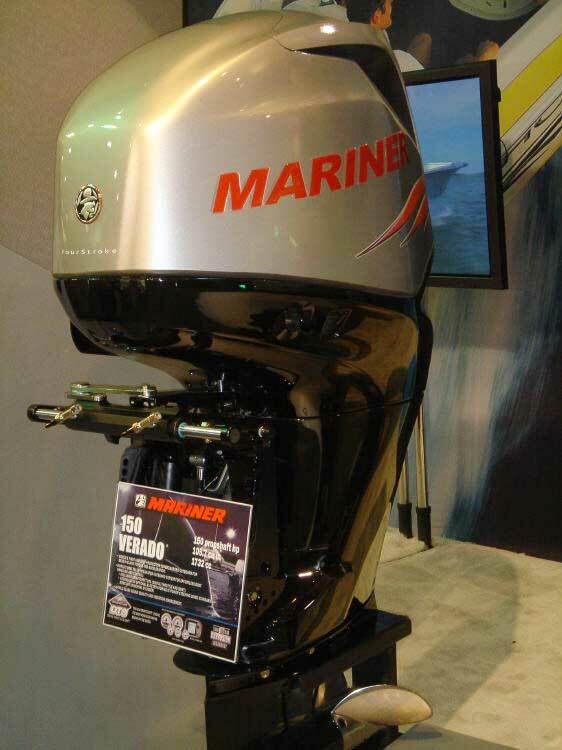 There were also two new models introduced, the 235 CONQUEST and a new version of the 320 OUTRAGE. 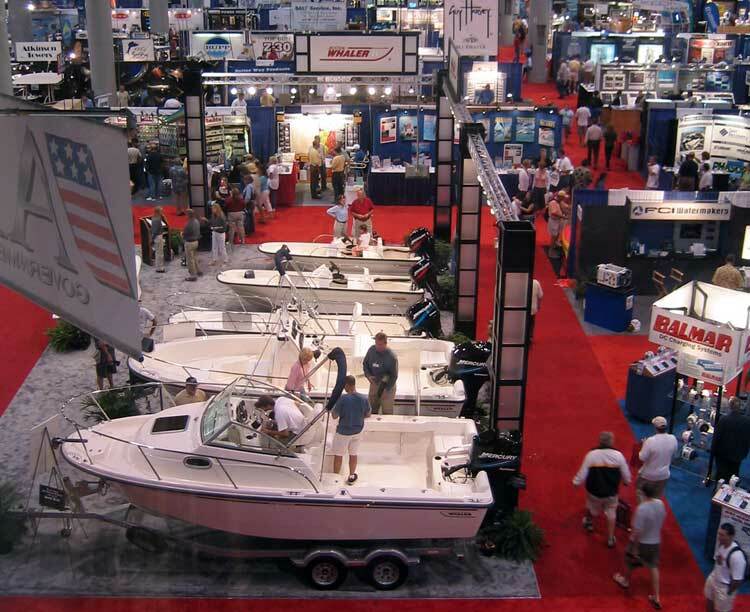 This overhead view catches only a portion of the Boston Whaler exhibit at the show. Lined up before you are most of the LEGEND series, starting with the 205 Eastport, whose roomy cockpit impresses everyone who comes aboard. The cuddy cabin is not quite as commodious. 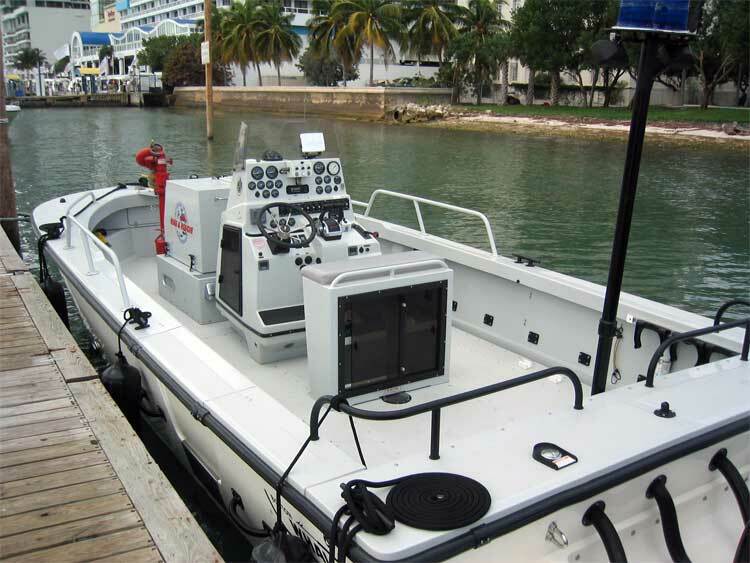 Boston Whaler had telegraphed the arrival of the 235 CONQUEST at the Miami show. The new model looked as good in person as it did in the numerous artist's renderings shown a few months ago in LEGEND magazine. The boat has a longer and lower profile than the other Conquest models, giving a profile similar to the classic cabin boats from Whaler's legendary past but with a more modern look. This is the largest of the Conquest models that can still be easily trailered on the highway. The optional factory designed hardtop and supports show the complex curves associated with Boston Whaler's high-styling of their hardtops. The stern is designed only for rigging with a single engine. 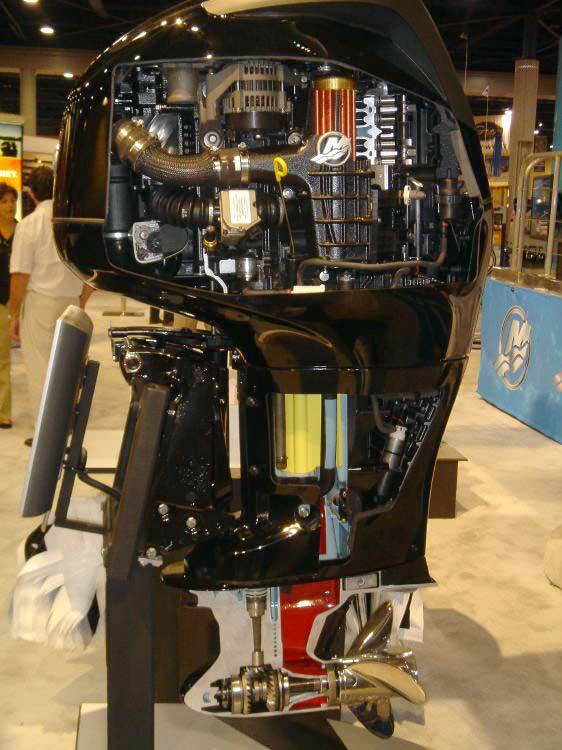 A big V-6 225-HP Verado provides the power for this model. The fold-out rear bench seat is an option. 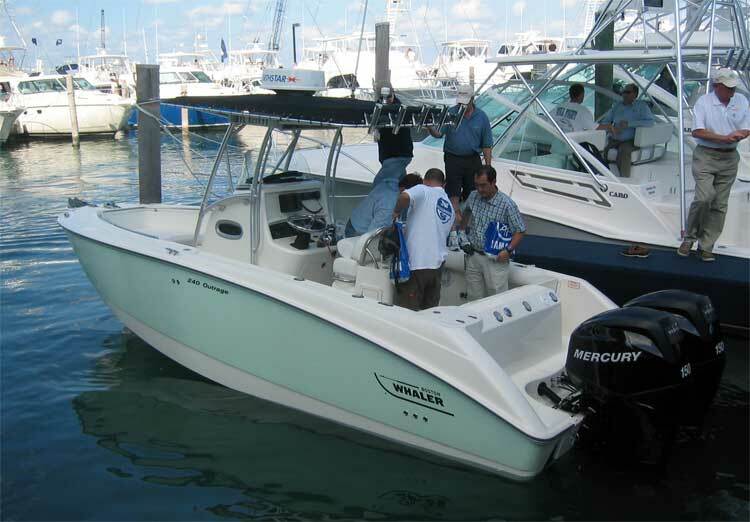 A classic Boston Whaler feature, the hawspipe, returns with an integral drink holder. 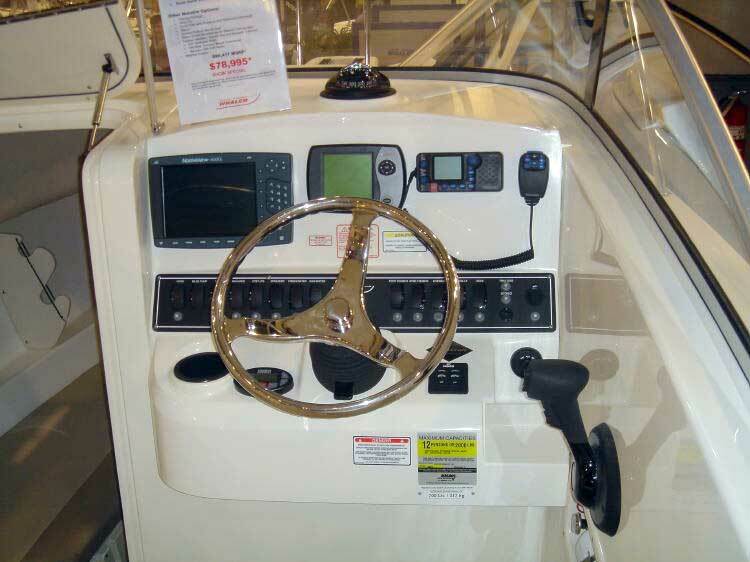 The boat comes factory-rigged with a NORTHSTAR GPS/Chartplotter/Sonar, a SmartCraft SC5000 engine display, and a NAVMAN VHF radio. 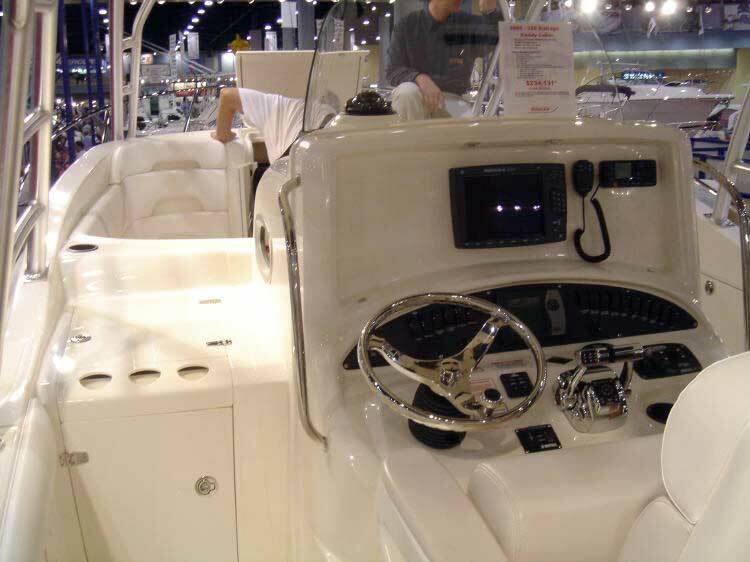 This boat also has power assist steering and digital throttle and shift. The side-mounted shift and throttle controls are a bit of a break from tradition. Other options include the fishing package, Porta-Potti with pump-out and overboard discharge, a stereo, and weather curtain set. The MSRP is $90,417, and the show special price just $78,995. 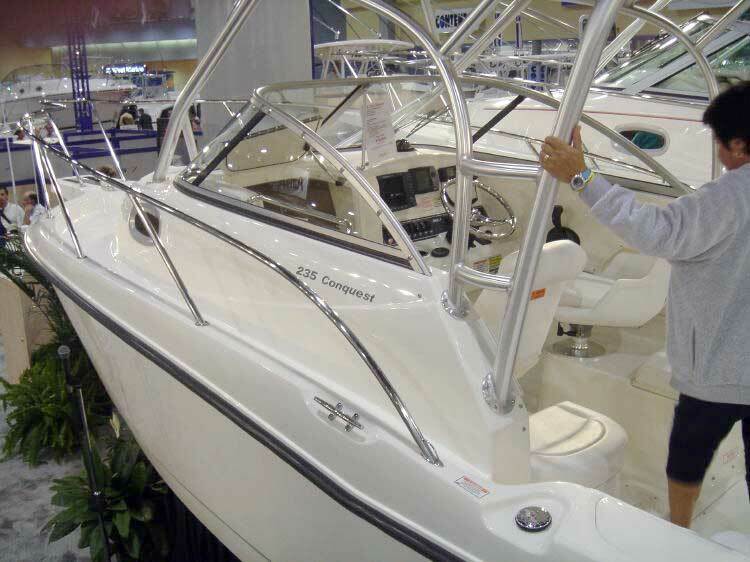 Boston Whaler had hinted that there would be TWO new boats shown in Miami. The 320 OUTRAGE CUDDY came as a complete surprise. No one had heard a whisper of this stunning new model. 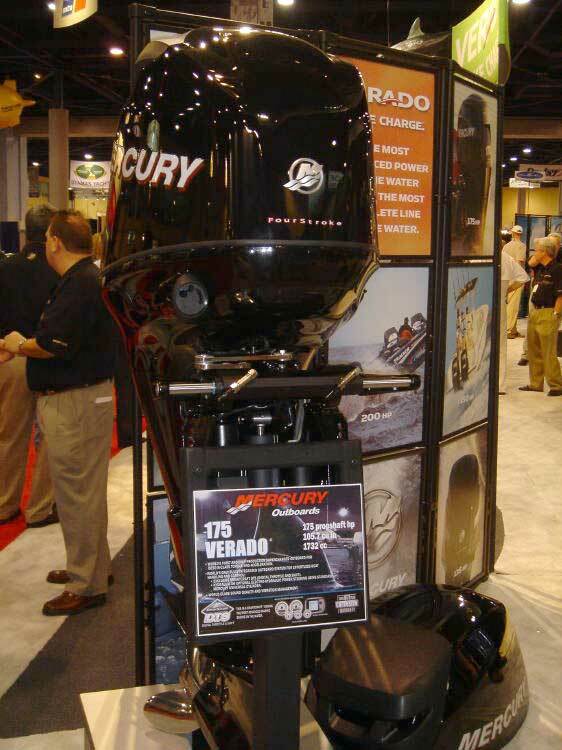 From out of the blue Whaler introduced this monster 32-foot center console with cuddy. Note the sea foam green hull color. A majority of these larger boats are ordered with the hull color option. 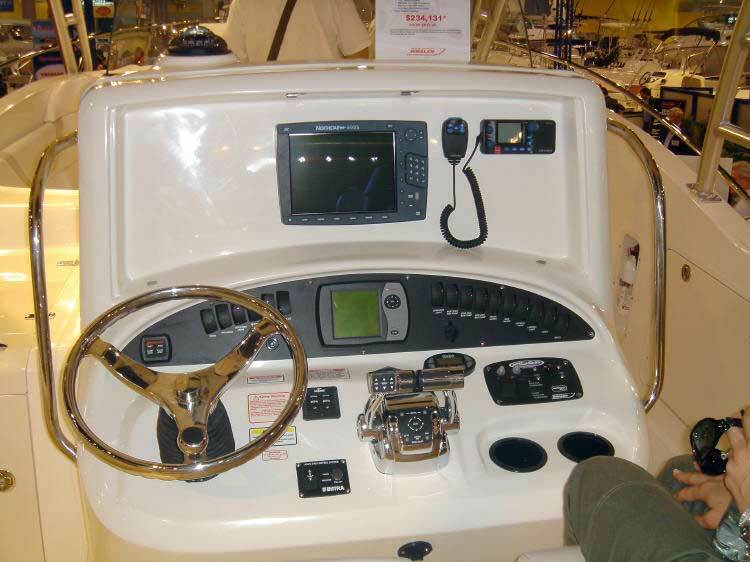 The center console connects to the gunwales on the port side, leaving a passage open on starboard to the forward cockpit. 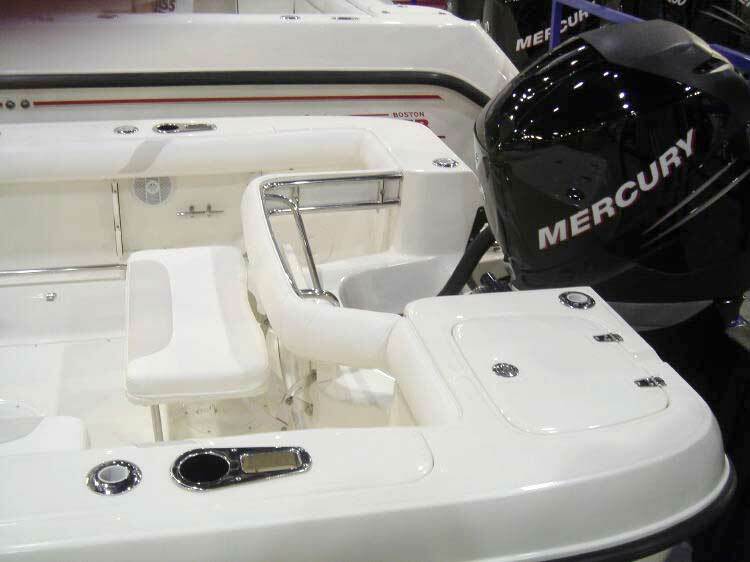 The Helm features the now de rigueur three-spoke custom steering wheel, the DTS throttle and shift controls--which you have to try to appreciate the great feel--and a SmartCraft SC5000 engine display. Another NORTHSTAR GPS/Plotter/Sounder is pre-installed, along with a NAVMAN radio. Yes, you are seeing correctly: the price is $234,131. While the guys are fishing off the stern, the ladies can enjoy the comfort of the forward cockpit. Oh my--is that wood I see? The teak and holly sole adds a nice touch to the cabin. The cockpit doesn't just have lockers, but rather some nicely engineered built-in appliances like this cooler. Here is the fish-eye view of the sea green hull. That bow should cut a nice swath into offshore seas. I never get tired of looking at the beautiful anchor and hawsepipe engineering. Brunswick Commercial and Government Products, now a separate entity from Whaler recreational boats, were also at the show. Back at the in-water docks, Brunswick Commercial and Government Products were showing this classic 27-foot Whaler hull fitted out as a fireboat. 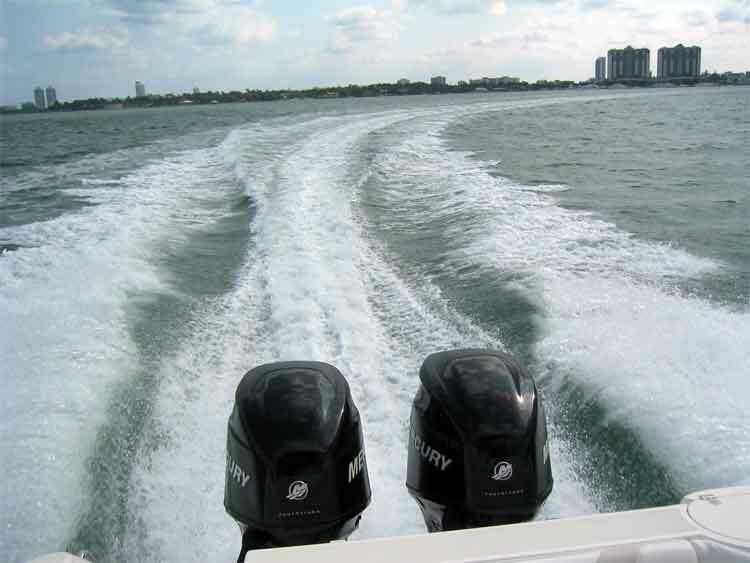 Cropped out of this view are a pair of 225-HP Mercury four-stroke outboards (not Verado) rigged on the Whaler Drive. 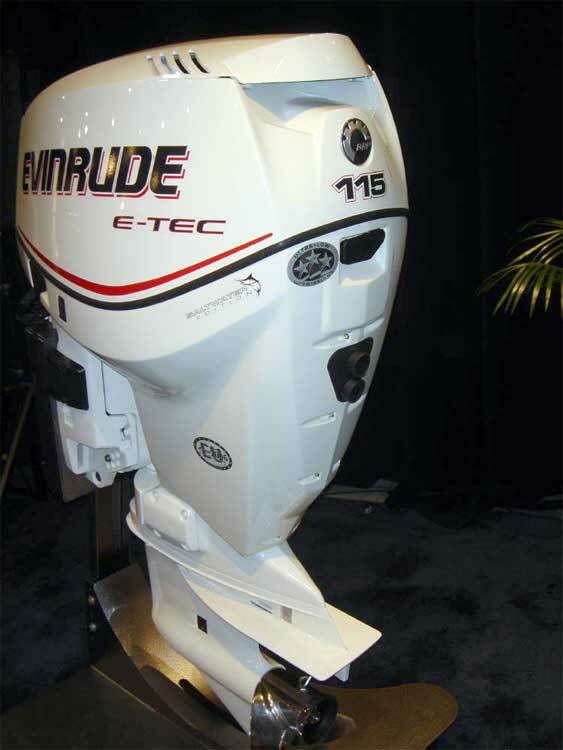 Also highly anticipated were new mid-range outboards from Evinrude in their two-stroke E-TEC series. The Bombardier boys were showing a new 115-HP model, but details are sketchy. We are still looking for other models and more information. This 115-HP E-TEC is thought to be a V-4 60-degree block. Is that the oil fill on the front top of the cowling? Displacement and weight are not known. The rear view sports the Bombardier logo and the 3-Star Ultra-low emission rating. 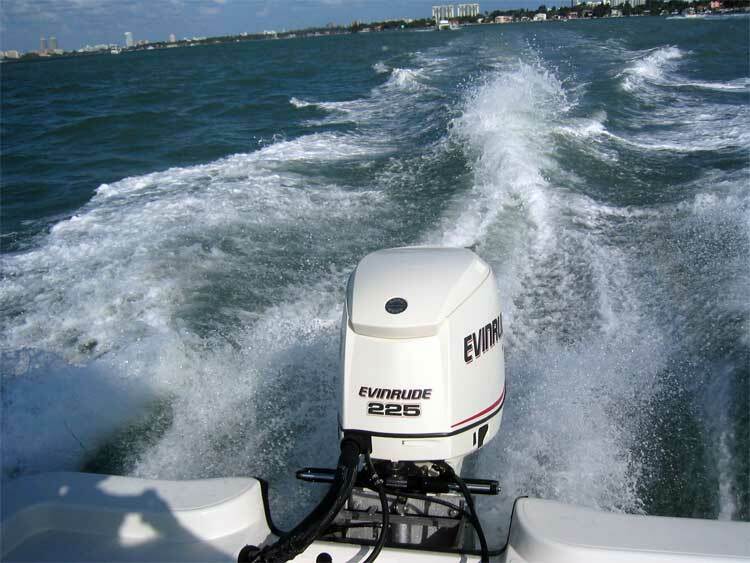 At the in-water docks, Allan Rossmore found an Evinrude E-TEC 225-HP on a boat that was available for demonstration rides. This is one of the best parts of the Miami show, as you can actually get out on the water with the new products and give them a try. 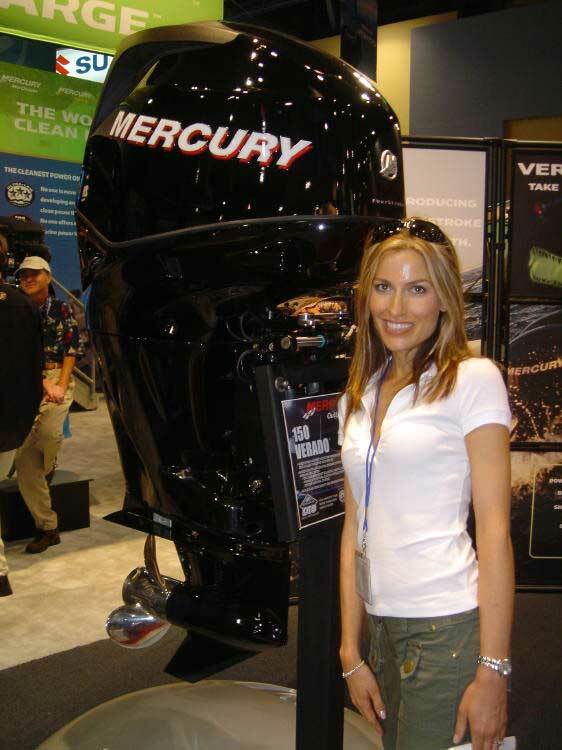 "I later got a ride with the Evinrude folks as well, on a Ranger 23 foot flats boat, which had a 225 E-TEC. This was also a very powerful, smooth running engine. Note how narrow it is as well. They are very light weight and powerful, as you know. I like those engines. If I were to re-power my Montauk at this time I would go with the E-TEC 90." 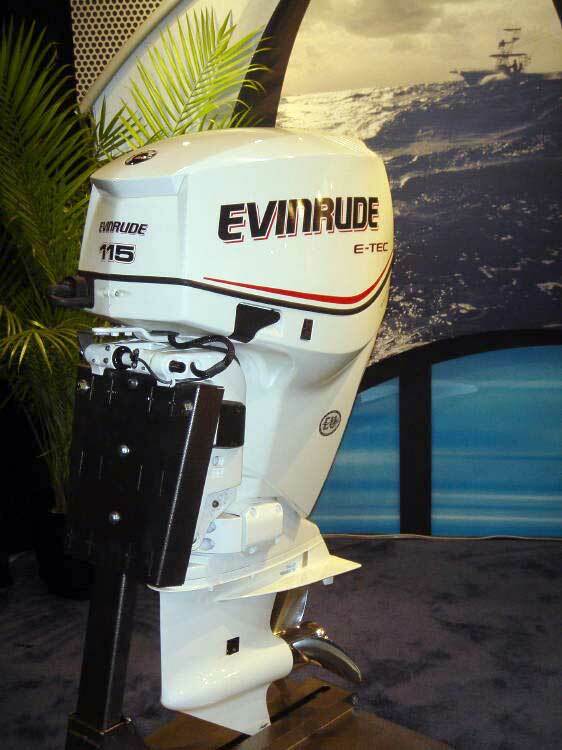 This 225-HP Evinrude E-TEC was rigged to a 23-foot Ranger flats boat, and demonstration rides were available. This model has been shipping since October, and it should be available for immediate delivery. The High-Output 20-inch shaft version is rumored to be in very limited supply. Accustomed as we have become to huge four-stroke motors with monstrous cowlings, this 225-HP E-TEC two-stroke looks rather slim and modest on the transom. The page has been accessed 103972 times. This article first appeared December 18, 2003.